This guide, created by Benjamin Applebee, Brett Schneider and Josh Patton, is broken into the 7 major degree programs. From International Security to Human Rights, this is your one-stop-shop for all matters Global. Last updated by CWA on 7/31/12. If you're a 1st year student at Korbel the online library resources, beginning with our homepage-library.du.edu, are meant to be your one-stop-shop for digital and mobile research and information gathering. Of course the physical office of the research center is always available wherever your pursuits in academia may take you and while each one of our full-time staff librarians are equipped to assist you, your area-specific liaison is Chris Brown (profile listed within each blue tab of this research guide) who is usually very easy to track down via email even when he is not scheduled in the consultation room! Search Databases, which contains our complete list of subscriptions that is also searchable according to subject (highly recommended to start this way as we have over 500 individual databases!) 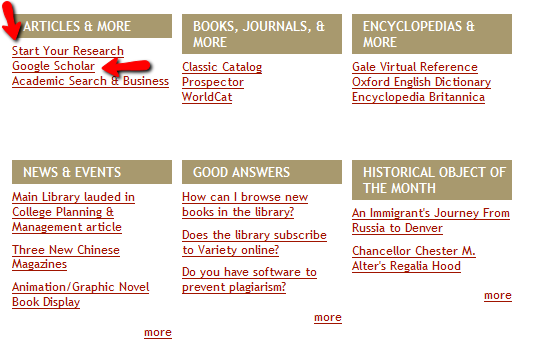 For a thorough listing of relevant listings of International Studies databases go here. And finally Search Credo Reference, which consists of, in addition to other things, one of our favorite online reference tools-Credo Reference or as we like to call it-the scholarly wikipedia, which is again an amazing starting place for getting background, historical and general information in the short to mid-range length on a topic. Also, the links for research guides (like this one and Chris Brown's other International Studies guides) and Google Scholar are on the homepage. The research guides housing links, databases, websites and more on a plethora of subjects and disciples are an amazing asset for finding data, statistics, articles and more that constantly surprise even ourselves. Google Scholar, which the library has a special subscription relationship with, should always be accessed first through our library homepage, which will prompt you to log in so that you may have access to far more material than you would otherwise if you were not a part of the unversity. As one of our most voluminous databases, Google Scholar will give you scholarly articles and citations (for books or other materials, studies, etc) and how many times that source has been cited amongst other very useful tools. Finally, for a complete listing of Korbel-sponsored resources including Centers, Clinics, Institutes and Journals click here. Get Help from your International Studies Liaison!